Indian Rice Grass, sculpted by artist Kevin Shaffer is part of Lafayette's Art on the Street Sculpture Walk. 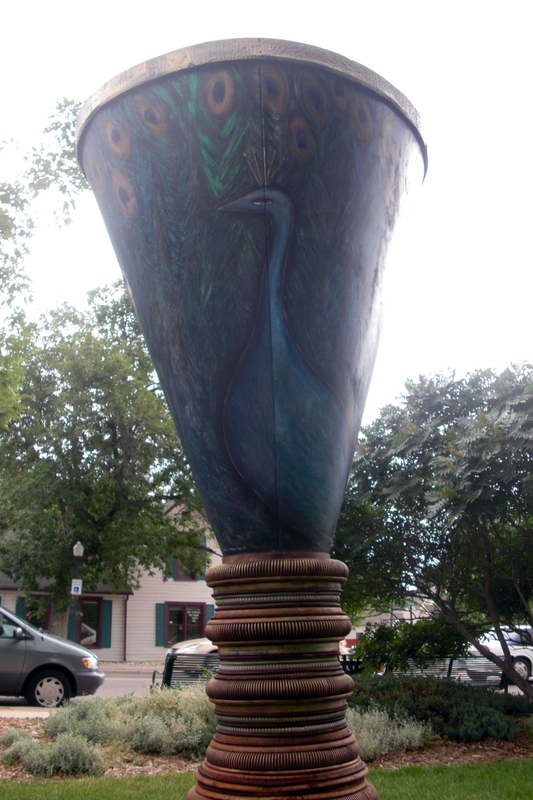 This large sculpture is located on Chester Street at the back of Festival Plaza in Old Town Lafayette. 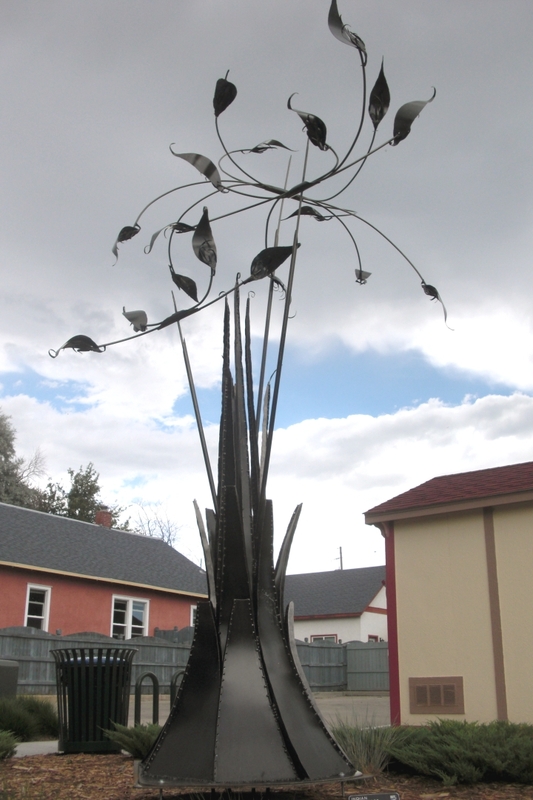 This sculpture is from a series of oversize abstracted steel sculptures of native plants. The inspiration for this piece comes from the native grasses that can be found in the grasslands around Lafayette and in eastern Colorado. This piece is 10 feet wide at the top and 16 feet tall, constructed of steel. As with all the Art on the Street sculpture, this artwork is for sale; this one is $15,000. For more information, or to purchase this art, contact the Public Art Committee. To view additional sculpture, look at the city webpage; and to vote for your favorite, go to the poll on this page. The favorite artist will win the Jean Melblom People's Choice Award of $1000. 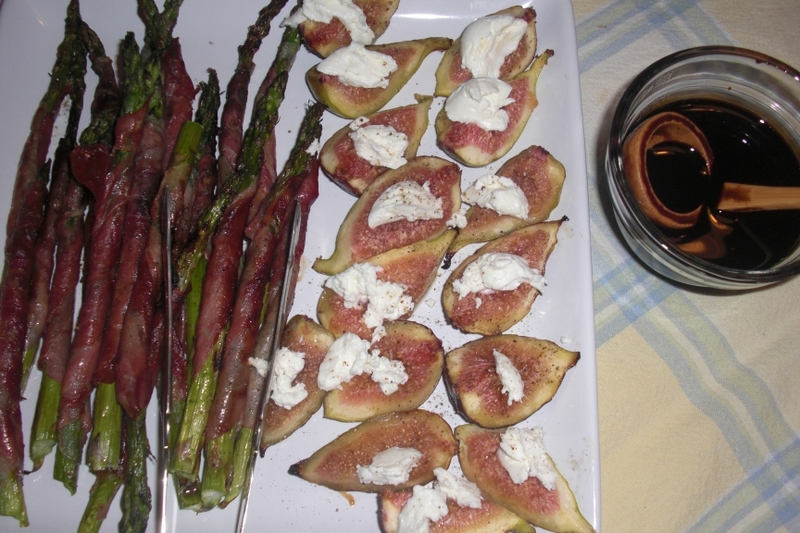 Coat the outside of the figs lightly with olive oil. Quarter the figs and place on a grill pan (easier to get onto and off of the hot grill). Heat your grill. 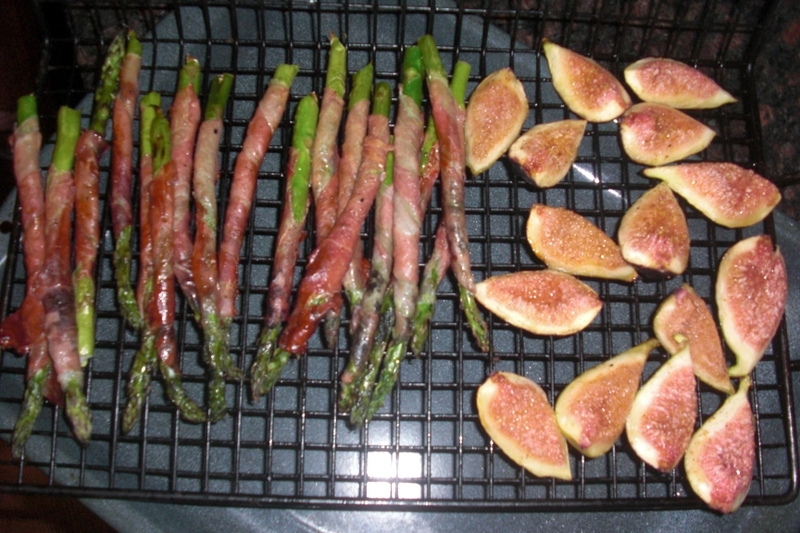 Place the figs on the hot grill for about 10 minutes, or until the figs appear to wilt, or become juicy. Spoon a scant teaspoon of goat cheese onto each fig while hot. Sprinkle with cracked pepper and salt to taste. Serve with Balsamic Syrup. Delicious! Ready to go on the grill. Cut your prosciutto slices in half. 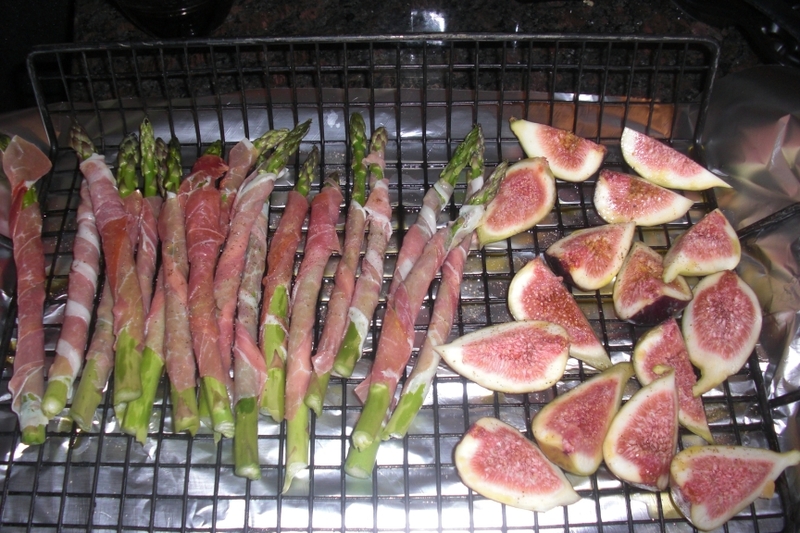 Wrap each spear of asparagus with 1/2 slice prosciutto. (You can use a whole slice of prosciutto, if you want a meatier appetizer) Brush the exposed tips and ends of the asparagus with olive oil. Place on a grill tray. Grill until the asparagus are bright green and tender and the prosciutto is crispy. Serve with Balsamic Syrup. Enjoy! 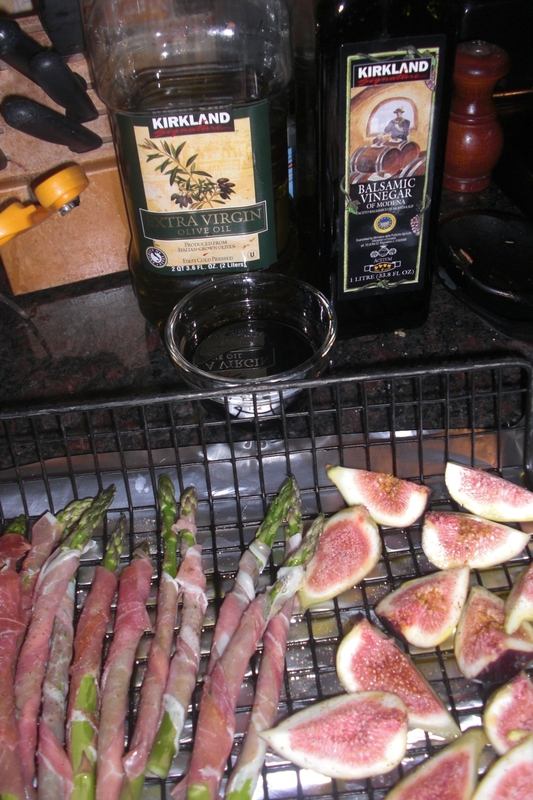 After they've been grilled, the Prosciutto is crispy, the figs are juicy. Place about 1 cup of balsamic vinegar in a small sauce pan. Bring to a low boil. Simmer for about 15 minutes until thickened. I reduced by about one third. I wanted my syrup thick but not gluey. Let cool. Serve with grilled vegetables. The finished appetizer - ready to eat! 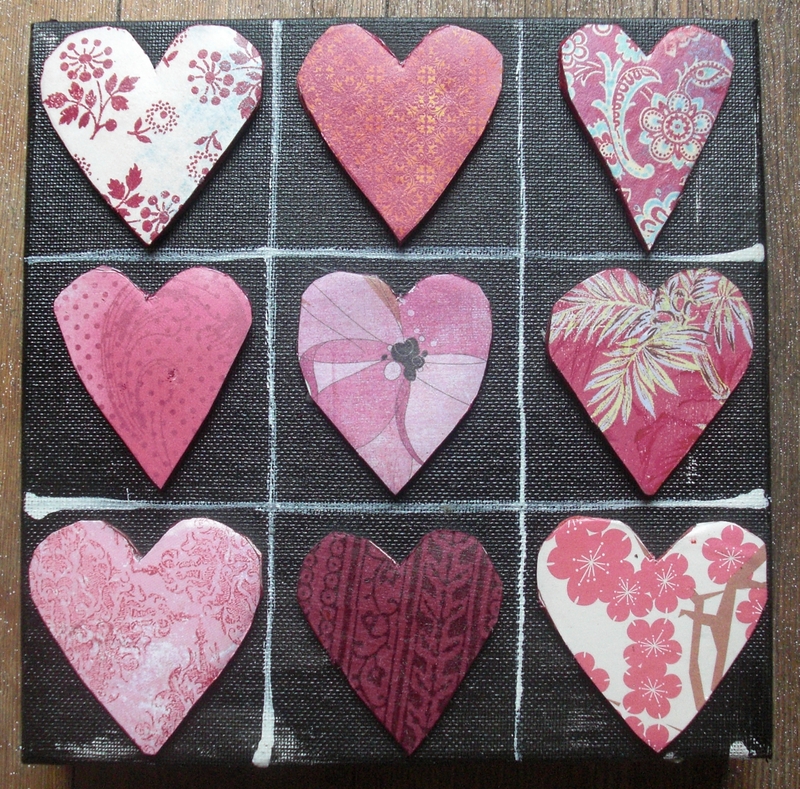 This is one of my summer collages - a Hearts Tic Tac Toe. 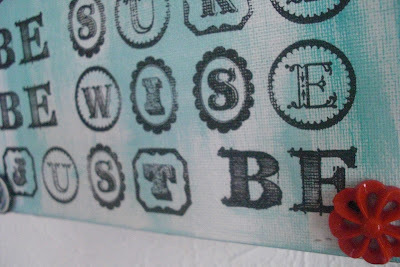 The words are on the outside edges of the piece. "ENJOY" runs up the left side of the frame. Made with a flat canvas board, painted black. 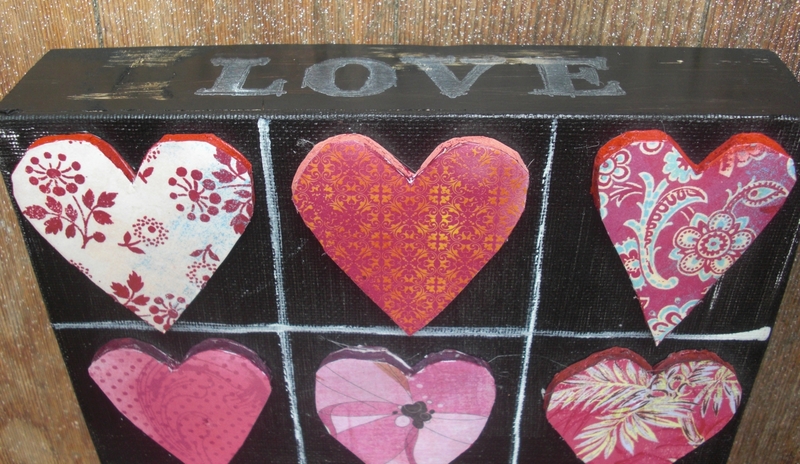 "LOVE" is printed across the top of the collage. Hearts from foam core, painted and covered with a variety of papers. "EMBRACE" runs down the right side of the collage. Scrap wood make the frame behind; then painted and lettered. "LIFE" is printed on the bottom of the collage. This one is very different from my other work. A sort of experiment, but I am pleased with how it turned out. I like the simplicity and the patterns. 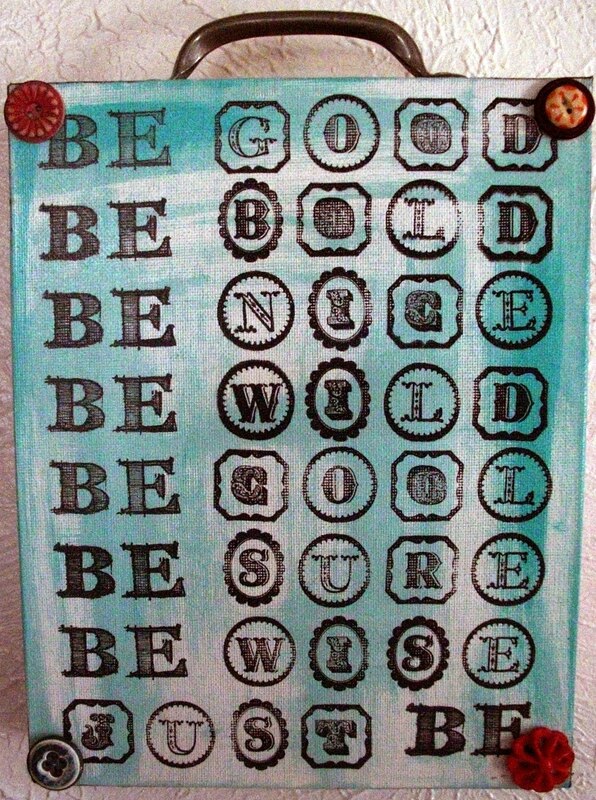 I like its hidden sentiment. This collage and more are available at The Purple Poppy. 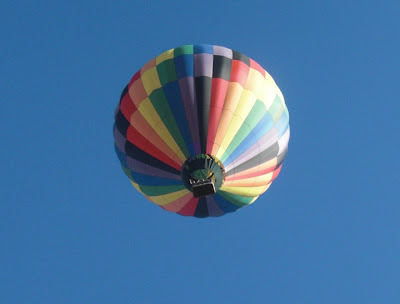 Yesterday, as I was taking my girls to school, we saw two hot air balloons. This is not an unusual occurrence in our area, but these were especially close to our house. 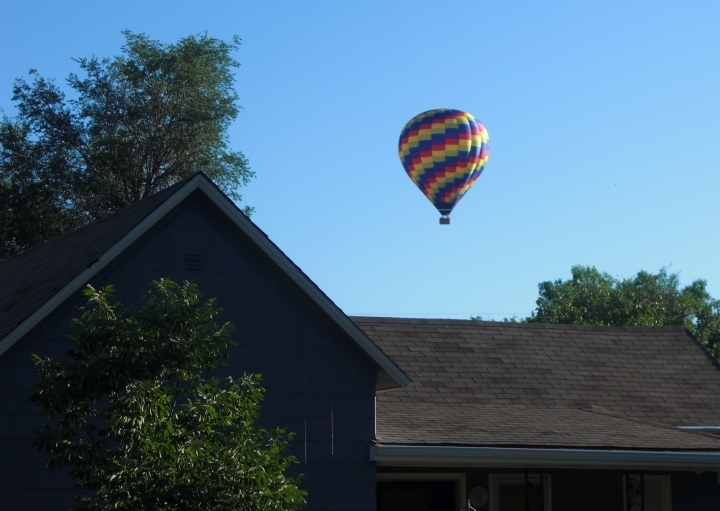 One was descending behind a house across the street. The second was right overhead. You can even see the people waving. Seeing hot air balloons on a regular basis is one of the many reasons I love living in my small town! Today, my small town experience wasn't so charming. I returned home from dropping one daughter off at school, and my older daughter said, I think something is in the wood stove. Now, we have had creatures come down the chimney and into the wood stove before, and I am not talking about the red suit type. We do have a cap on the chimney, and we haven't had an unwanted visitor in several years. There is a little scritch, scritch noise. 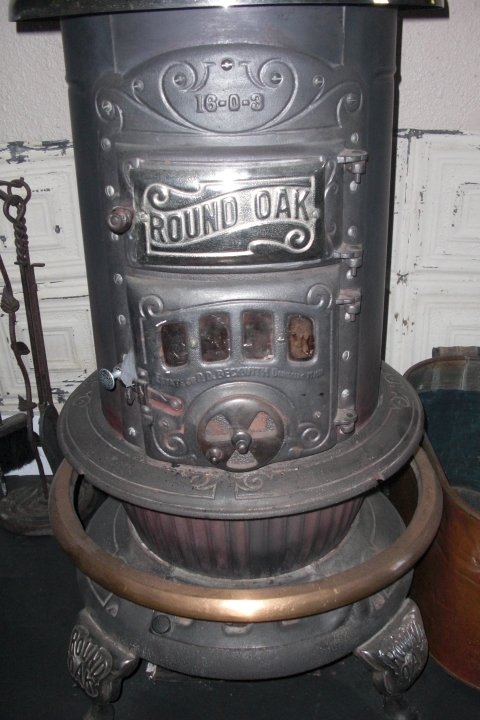 Thankfully there is a door on our wood stove, and whatever has crawled in is contained. But, we can't see in to know if it is bird or beast. Upon closer investigation, I see that a wing has managed to slide through the crack of the door. 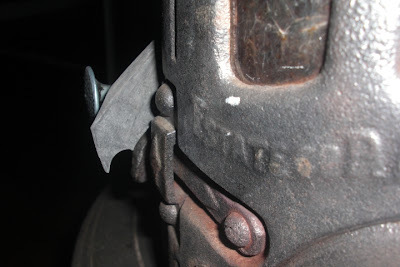 It is a BAT wing. The poor, unhappy bat then thrust his wing further out and started waving at me. That's when I lost my cool! My daughter and I were completely creeped out (to use her terminology)!! I am sure the bat doesn't feel any better than we do. Today's small town experience reminds me that we don't live too far from nature. We are happy to have open fields and lakes and parks nearby. Hopefully the small town animal control will be able to help me out. I guess even the bat is a good reminder of why I like living where we live. 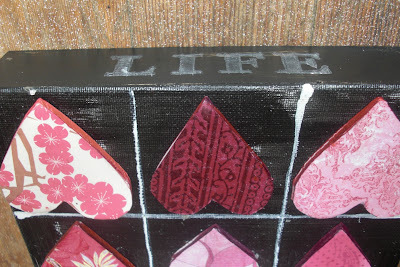 So, it has been almost a month since I have posted on either blog. Without apology. The end of summer vacation was a stronger draw than the uncomfortable office chair in our warm and stuffy office. 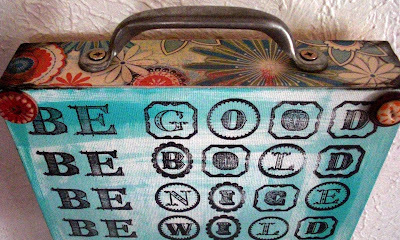 Plus, I have found that if I blog with the sense of obligation, it will feel like a job, a duty, a chore, a chore worse than doing laundry. So, I blog without obligation, without apology. The end of summer was filled with bike rides, a trip to Elitch Gardens Amusement Park, trips to the farmers market, back to school shopping, afternoons at the local pool and making s'mores. No regrets. But, I am back. To share more art, more recipes, more about my little town. I found this little man of an eggplant at the Isabelle Farm Stand at Thomas Open Space in Lafayette, Colorado. 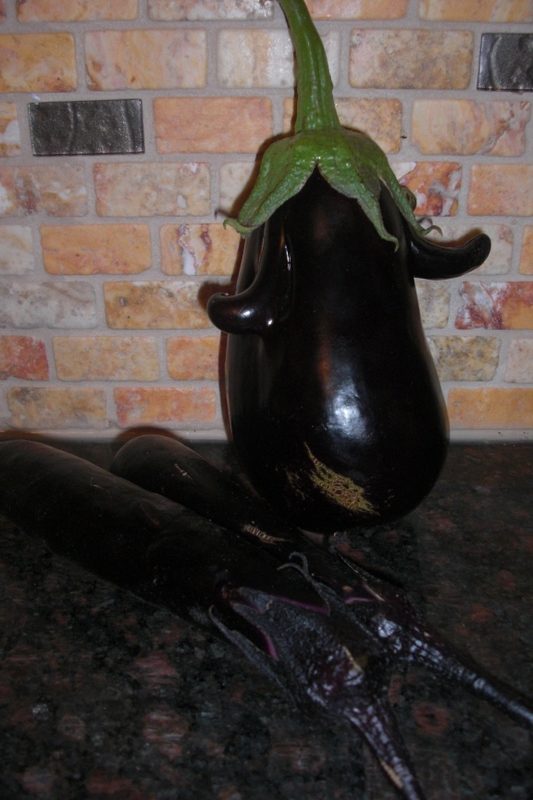 I asked the farmer who grew the eggplant, how he got "arms" to grow. He told us he talks to them. That made me smile, thinking of this young man stooping over to cajole the eggplant into growing appendages. I am going to have a hard time cutting this one up. I think he's so cute with his two arms and little hat. My favorite way to prepare eggplant is to slice it and grill until soft. I usually salt the slices and let them sit for a few hours before grilling, that will take out the bitterness. Grilled eggplant is decadent served with a smear of goat cheese and a drizzle of balsamic vinegar. But, I like it plain, too. I may just have to start with the two Japanese eggplant and save the little man another day! The City of Lafayette Public Art Committee installed its third year of the Art on the Street Sculpture Walk at the end of May. Sixteen sculpture were installed as part of this art on loan outdoor gallery. I want to share our latest installations with you - we have a wide variety of work. I shared last year's selection in a series of Sunday blog posts starting last November. I will do the same again this year. They are really better in person. If you're local, come to Old Town Lafayette and take a walk to see for yourself. While I don't have an absolute favorite, the first piece I want to introduce you to is Bruce Campbell's Peacock Goddess. 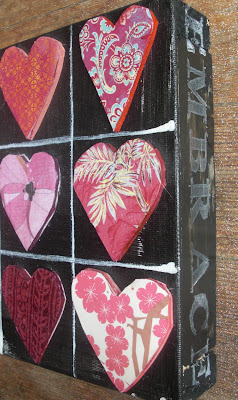 Campbell is a great local artist, with national acclaim. 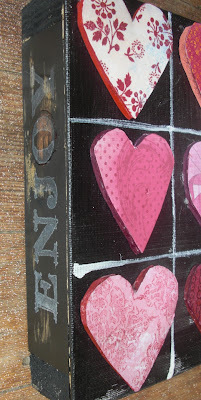 His work is "recycled" and repurposed farm and other metal pieces. Utilizing salvaged industrial objects, Colorado artist Bruce Campbell merges painting and sculpture to create ancient contemporary artworks. The unique shapes and surface patinas, sculpted by time and weather, become an integral part of his imagery, which seemingly emerges from the intricately weathered surfaces. Peacock Goddess is Campbell’s second work in Art on the Street. The back of the piece is interesting as well, with a large peacock. This piece sits on the lawn at Festival Plaza in Old Town Lafayette. The Plaza is on Public Road at Chester Street. It's a great gathering place, with park benches, a fountain, 4 pieces of art and the best sandwich and ice cream shop called Eats and Sweets. This work, and all the 16 pieces in the Art on the Street, are available for purchase. This piece costs $20,000. You may view the other 15 sculptures on the City of Lafayette website. Each of these sculpture is competing for a cash prize of $1,000. If one of these sculptures is your favorite you can vote. The poll can be found on the lower right of that page. You can vote to support your favorite artist. 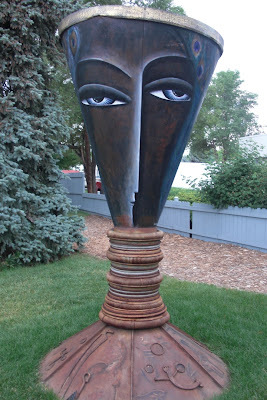 For more information, or to purchase this sculpture check out the Cultural Arts web page. I hope you will enjoy my tour of Old Town Lafayette over the coming months. I sure enjoy having this much art in my little community. 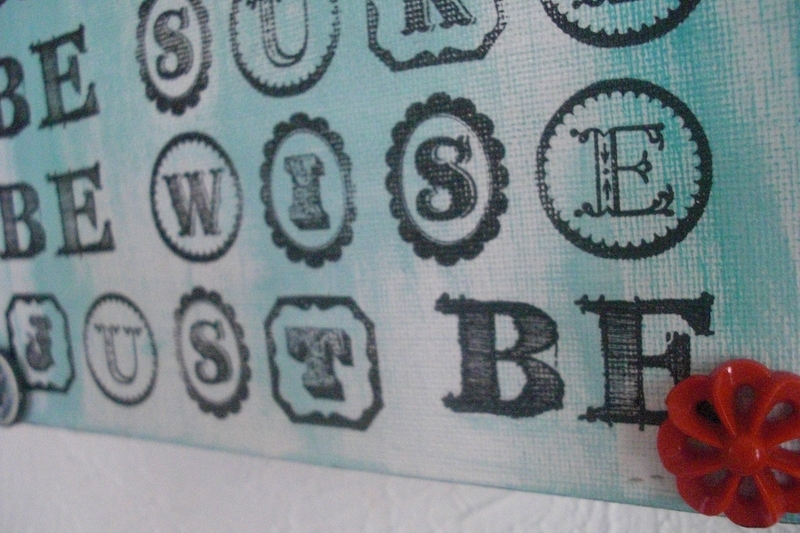 I have spent some time in my studio recently, experimenting with new designs and styles. This is one of my latest. I almost always use words, so I decided to use lots of words. 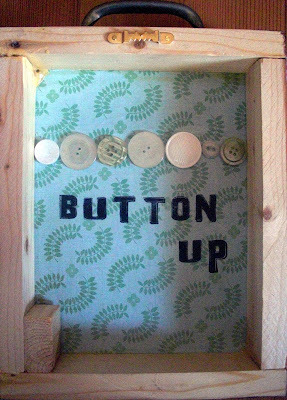 I still used a variety of patterned papers (on the sides), some vintage hardware (on the top) and a few old buttons. I like the conversation this one generates. 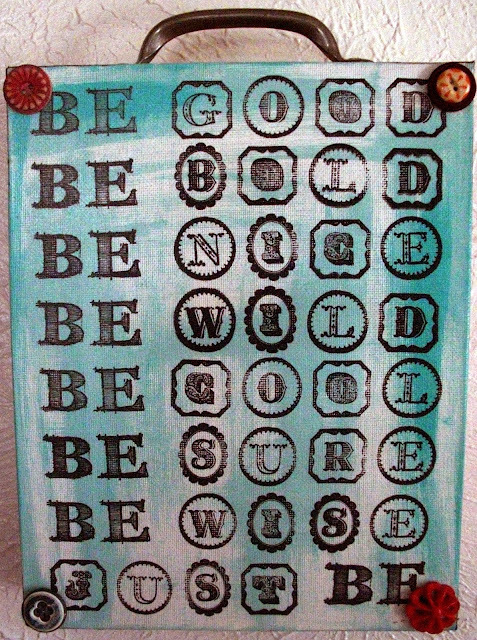 This very bossy collage has something to say.